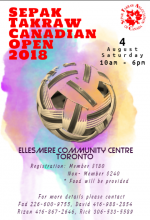 2017 Canadian Open Sepak Takraw Championships, A.E. Wilson Park, Regina SK, August 5th:STAS & STAC are pleased to announce that the 2017 Canadian Open Sepak Takraw Championships will be hosted in Regina, SK, August 5th, 1:00 - 6:00 p.m. by the Karen Youth Association of Regina as part of the Karen National Youth Conference! There will be teams from all across Canada, including THREE teams from Regina to represent Saskatchewan! It will all take place at A.E. Wilson Park, just north of Dewdney Ave. on McCarthy Blvd. If you are going to be in Regina Aug 2 & 3, you will NOT want to miss this event!! Circle the dates on your calendars and come on out to the University of Regina, Gym 2, to see the amazing, high-flying action! Aug 2: 10:00 am - 4:00 pm. Aug 3: 2:00 - 6:00 pm. Admission: Accepting donations at the door. Due to extreme amounts of rainfall and wet ground conditions, Wascana Centre Authority will not allow events to be taking place on the lawn during Canada Day. Therefore the Canada Day Open Provincial Tournament that was scheduled to take place on the Legislative Building's front lawn has been cancelled. 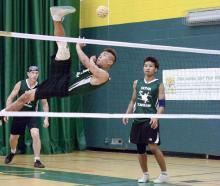 There is a motion on the table to combine the provincials with the 2014 Canadian Open Sepak Takraw Championships that will be taking place on August 2 & 3, at the University of Regina, Gym 2. Legislature Front Lawn, Regina SK, July 1, 10:00 a.m. – 4:00 p.m.
Got Old Videos You'd Like to Preserve? Celebrate July 1 in Regina with a group of friends, co-workers, or family playing a FUN new sport together! 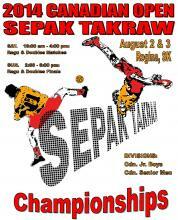 The 2013 Saskatchewan Sepak Takraw Championships are just a month away! Get your teams ready. Contact the STAS office about playing any other teams in your district prior to provincials. Let's make this tournament even bigger than last year. Click HERE for all the details (EventsPrgmsServices/Events/Provincial Tournament).